Another incredible addition to the community by James Simon. Mr Simon has often worked with local kids to create fun, whimsical, beautiful pieces of art, but never with kids as young as the ones he mentored this time. 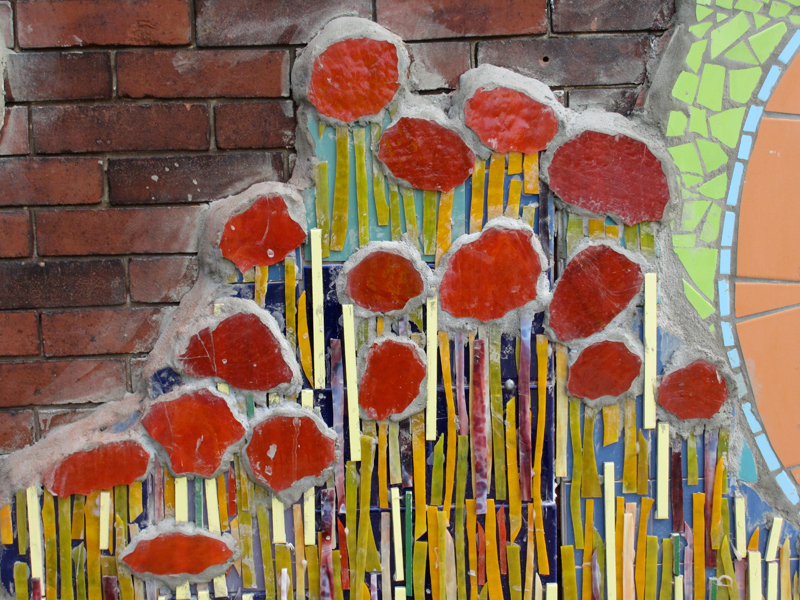 This piece was done as part of the Summer Art Camp for ACH (Amon Cashmere Harris) Clear Pathways. ACH Clear Pathways is a non–profit organization named in tribute to a 7 year old boy that died from a heart condition. His mother, Tyian Battle, has created an organization to engage, teach and give direction to the other children in the community through performance and visual arts. This particular Summer Art Camp was funded by McAuley Ministries, and that allowed ACH Clear Pathways to bring in an expert to work with the kids. Instead of a project that these 5–12 year old kids might take home to hang on the refrigerator, this time they helped create real art. The kind that people will stop to admire for years to come and that these kids will feel a sense of accomplishment from. James Simon looked at his canvas – the side of Rose Reilly’s house – and saw a big, vertical space perfect for a bass player. He offered the suggestion and the only request he received was to include at least one child in the design. 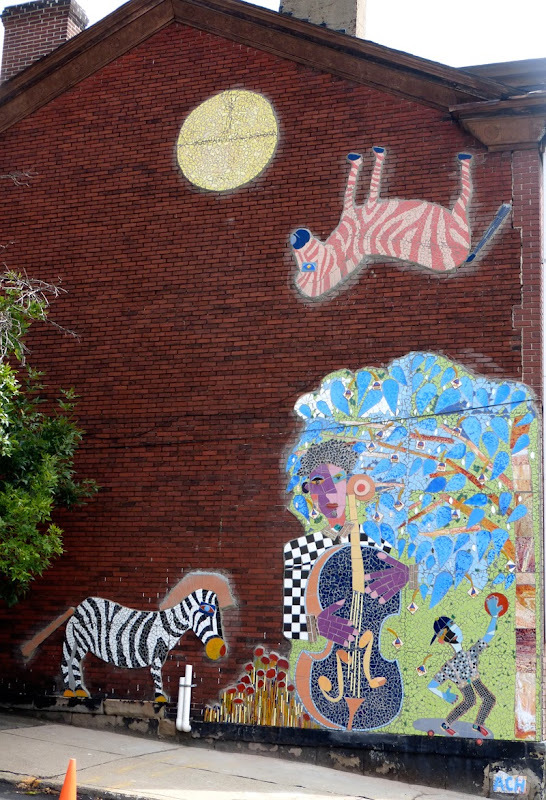 Mr Simon designed the mural with the bass player, a boy, two zebras and a full moon. The boy is on a skateboard with a basketball and wearing his cap backwards. 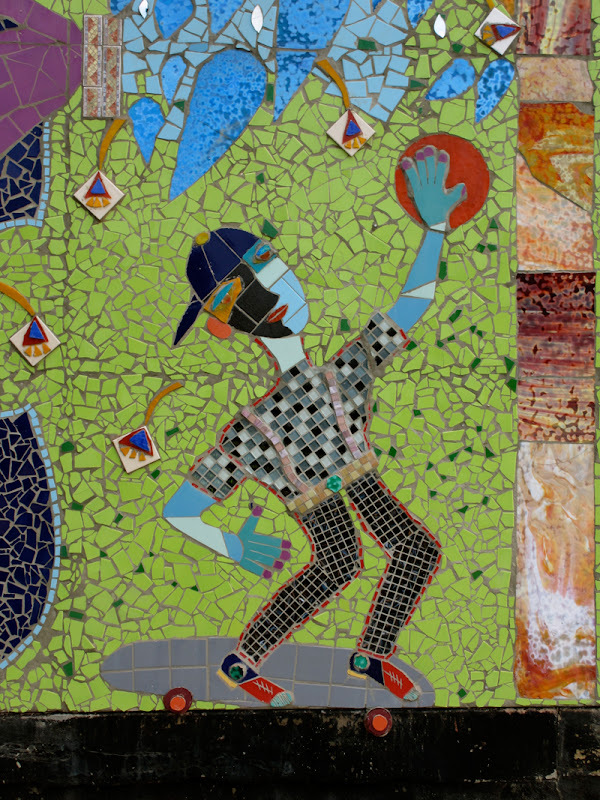 Over the course of about two months, James Simon showed 25 kids how to break the tiles and lay out the colors to create the images. They helped him glue pieces in place with the design on the floor. 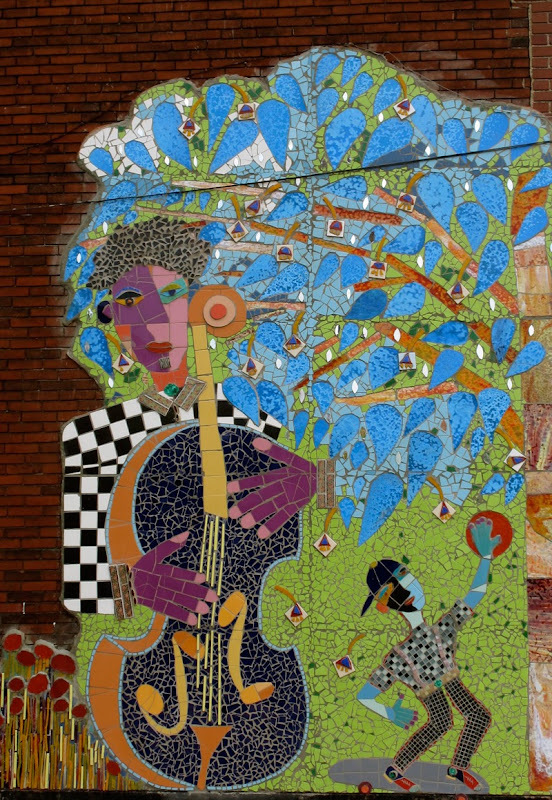 Later, when the separate sections of the mural were complete, Mr Simon attached them to the building. The children wouldn’t see the whole picture until the end. Tyian Battle looked at the finished mural and was surprised to see the boy wearing his cap just like her son did and doing the things that he enjoyed doing. She had not told Mr Simon that her son enjoyed skateboarding and basketball or that he always wore his cap like that. When we asked about the zebras and what their significance was, we got James Simon’s usual response to those questions: ...because I liked it . 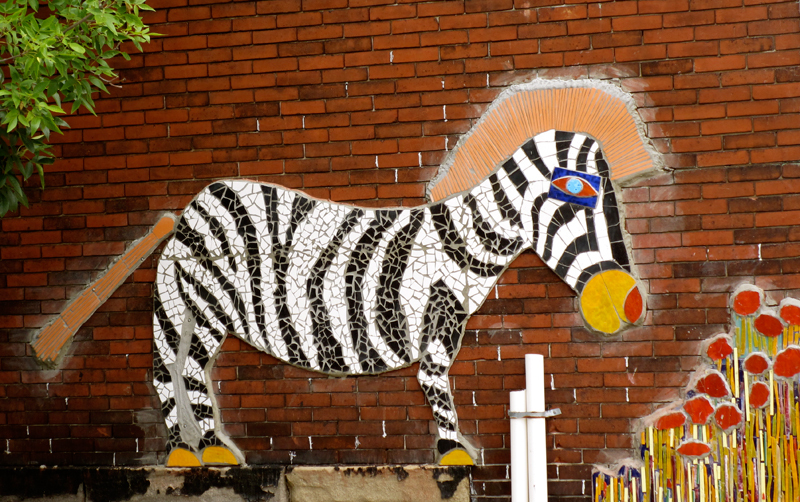 He especially liked the psychedelic zebra, as he described it. 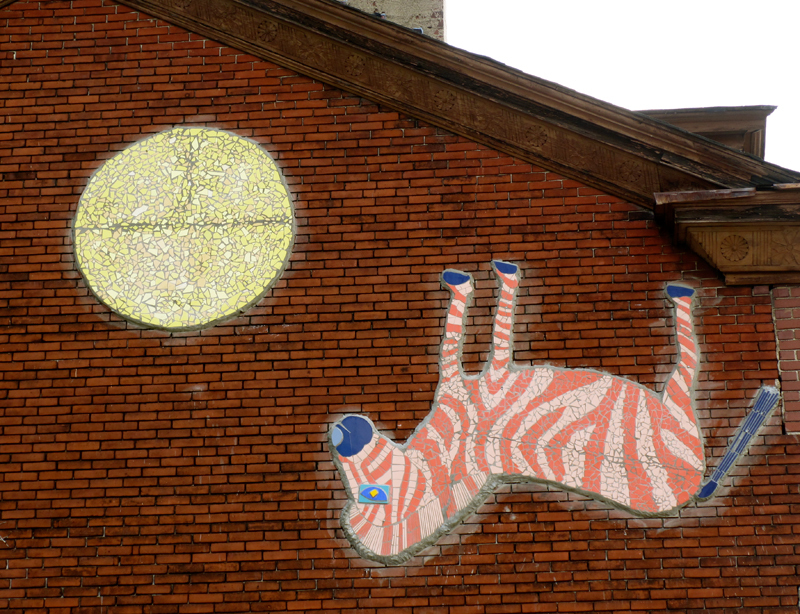 Why the upside down zebra? I made a mistake he joked. I think if you want to find symbolism or deep meaning in these, you’re looking at the wrong art. James Simon’s works are all about fun and things that he likes. Turtles all the way down. There are no reviewed comments for this page yet.